An intimate luxury lodge in the far Western end of Bhutan’s lush Punakha Valley, COMO Uma Punakha exudes serenity and relaxation. The second Bhutan hotel by COMO, Uma Punakha is set apart by its sleek modern interior that blends seemingly into the landscape through its traditional design. In the secluded remote valley, look out over the rice fields that are framed by the snaking Mo Chu River. With two free-standing luxury villas and eight deluxe hillside valley rooms, this unique hideaway has a piece of tranquillity for everyone. The remote location means it’s a 5-hour drive from the nearest airport (Paro), but the views and spectacular surroundings upon arrival make it worthwhile. From the Punakha Valley, you can also access the famous Temple of the Divine Madman and the Imposing Punakha Dzong. Some may just want to unwind and enjoy the views, but the adventure seekers can go hiking and explore the surrounding rice fields. 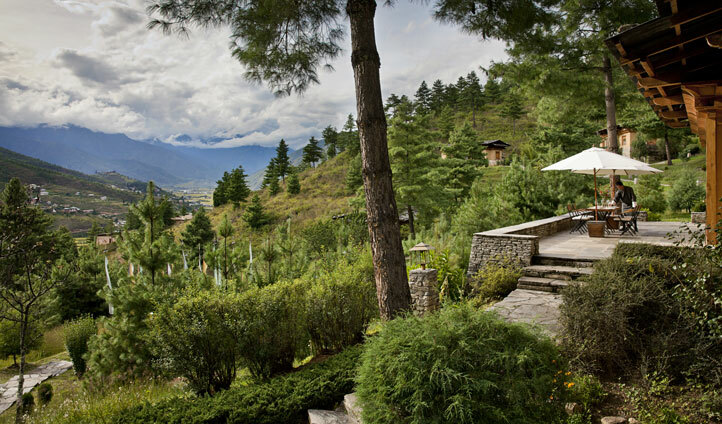 Each room has panoramic views of the Punakha Valley, with the Mo Chu winding through the rice fields and orchards. For ultimate privacy go for one of the luxury villas, with the two bedroom villa ideal for families and the other for couples, the spacious and sleek interior accentuates the outdoor environment. The eight valley rooms include all the modern features with either king sized or twin beds and spacious bathrooms, with some looking out over their own private terrace. If it’s the spirit of adventure you’re after or just a relaxing break in Himalayan scenery, there’s something for everyone at COMO Uma Punakha. Take one of the professional English speaking guides and go on an exploration or just simply sit back and relax with a traditional Bhutanese hot stone bath. Either way, Uma is the perfect location to get back in touch with your inner self, without compromising on those luxurious touches you know and love.